Die neuen Macbook-Pro-Modelle folgen dem gewohnt hohen Apple-Standard. Etwas mehr CPU-Geschwindigkeit und mehr RAM-Speicher im Vergleich zu den Vormodellen erfreuen den Anwender. Zudem hat Apple die Preise teilweise gesenkt, auch wenn sie immer noch sehr hoch erscheinen. Verbesserungspotenzial gibt es bei der Grafikleistung, die nicht mehr auf der Höhe der Zeit ist. Das 13,3 Zoll große MacBook Pro mit der Kennzeichnung MGX72D/A ist die niedrigste Standard-Konfig. Trotzdem überzeugt es im Test mit modernster Hardware, starker Performance, einem exzellenten Display und sehr hoher Office-Laufzeit, die selbst viele Ultrabook-Konkurrenten alt aussehen lässt. 80% Apple's more portable MacBook Pro gets even faster, but is it worth the upgrade? If you need tons of storage space and the most processing power you can get your hands on, the 512GB Retina MacBook Pro is the only way to go - but you'll need the deep pockets to match. However, if you can get by with less storage and power, in comparison you can save a healthy wad of cash by opting for the entry-level machine with 128GB storage, which represents the best value of the three due to both the faster CPU and doubling of RAM compared to last year's model. 100% Apple MacBook Pro 13"
In July, Apple updated its MacBook Pro range. 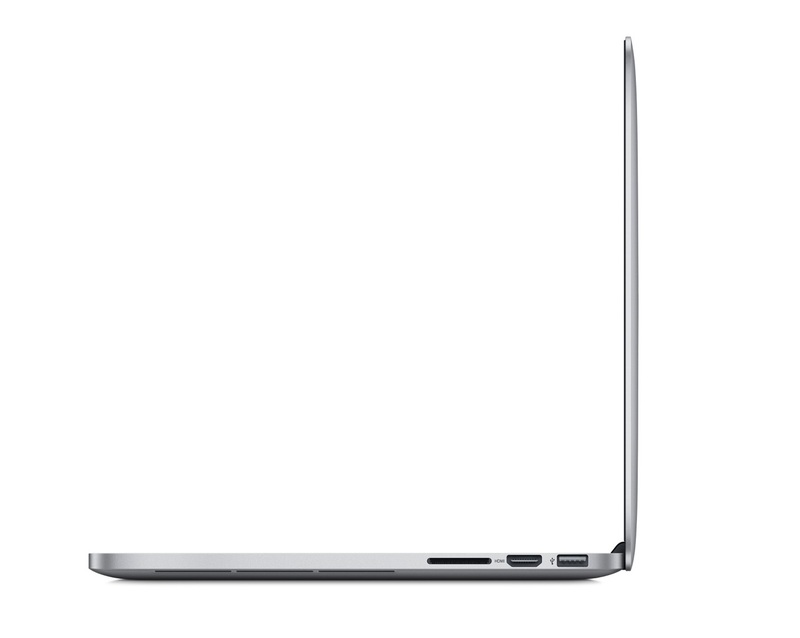 The latest version of the MacBook Pro 13" with Retina Display varies very little from the previous generation. It performs as well as ever, and we were pleased to note a slight improvement in performance thanks to the new processor. As we said, it's conceivable that Intel's Core M will bring buyer's remorse to anyone who picks up a laptop in the next few months, but there's little reason to fear that the MacBook Pro with Retina Display will become outdated or obsolete tomorrow. It's packed with modern technologies ranging from PCIe flash memory to 802.11ac Wi-Fi, and frankly it's hard to imagine the system gaining much better battery life than its already sensational stamina. There may be Windows alternatives that provide greater performance or screen resolution, but 13in MacBook Pro With Retina Display combines screen quality performance, portability and battery life into a package that is unmatched. The £999 starting price makes it more attractive to businesses who may be considering deployment. The new MacBook Pro with Retina is the tiniest product refresh yet, and while there’s nothing here to get hugely excited about, now is the best time to pick up one of these wonderfully-made, adequately powerful and beautifully thought-through laptops. It still stands head-and-shoulders above the competition, too. The new 13in MacBook Pro is still very expensive, but when this year’s best model costs just £50 more than last year’s, you’re getting much more for your money. With a beautiful Retina display, a large SSD, powerful hardware and improved graphics performance, the 13in MacBook Pro stands head and shoulders above every other ultraportable available today. You simply won’t find another laptop like it at this price, so it wins a well-deserved Ultimate award. The price cut this time around may well be due to currency fluctuations rather than any real generosity on Apple’s part – there’s been no comparable change in the US prices for the MacBook Pro – but a starting price of £999 for the Retina models should certainly bolster sales in time for the new school term. And, with its smart, lightweight design and strong battery life the MacBook Pro With Retina Display can still give its Windows Ultrabook rivals a run for their money. In 2013, when Apple reduced the price of the MacBook Pro with Retina display range, we stopped recommending the 13-inch MacBook Air on the basis that there was only £150 difference in price. As Apple has continued to drop prices we are still looking at just a £150 difference between the two ranges at the entry level. It's great to see Apple reducing prices across its MacBook ranges, but the lower prices of the MacBook Pro Retina range do have the effect of making the MacBook Air look less attractive in comparison. However, we still love the MacBook Air, which is lighter and thinner, although a fraction bigger than the MacBook Pro with Retina display. If it's the MacBook Air that you have your heart set on, you can't go wrong with it, but if you have a little more in your budget, then consider the MacBook Pro with Retina display because it's a really good deal in comparison. 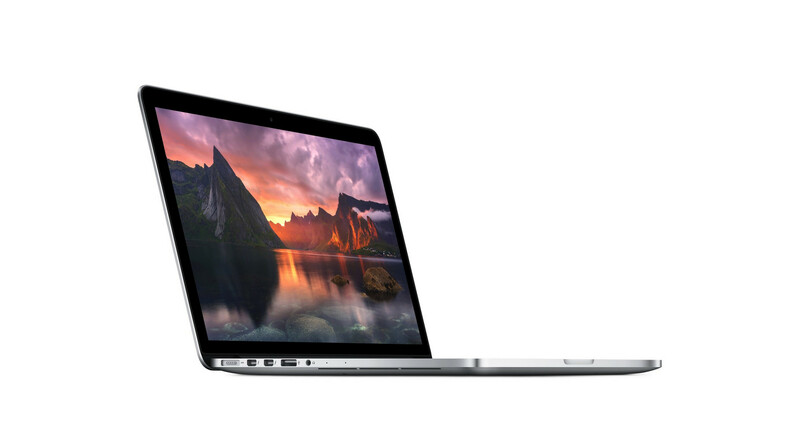 Once again, Apple delivers an exceedingly well-rounded notebook in the 13-inch MacBook Pro with Retina display. This 2014 update brings improved performance and battery life over last year's model, and starting at $1,299, it's expensive, but not outrageous. For me, though, the 13-inch MacBook Pro is a bit of a tweener. 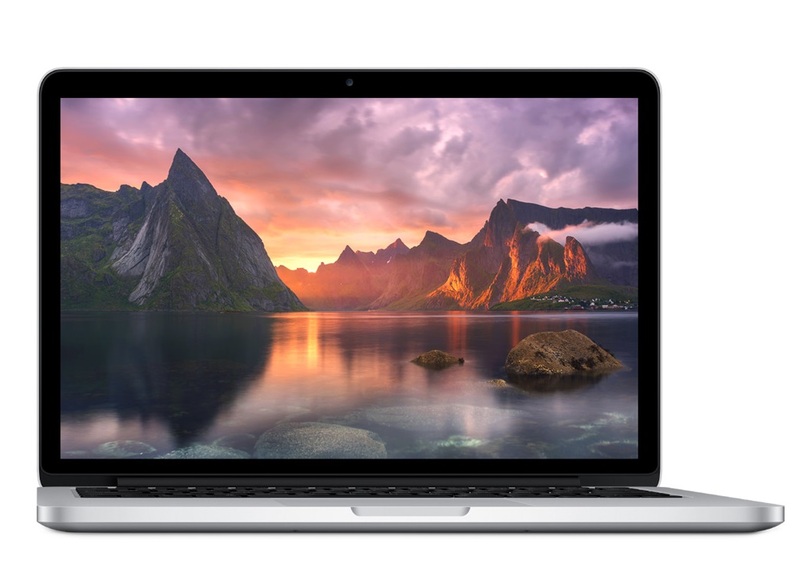 The Apple MacBook Pro 13-inch, Retina Display (2014) ($1,299, as tested) is the newest base model in the line, with a 2,560-by-1,600-resolution screen, speedy Intel processor, and excellent connectivity, particularly with its pair of 20Gbps Thunderbolt 2 ports. It lasted more than 13 hours on our battery rundown test while topping our performance benchmark tests. These improvements help the latest 13-inch Retina MacBook Pro$1,234.99 at Amazon replace the previous version as our Editors' Choice for high-end ultraportable laptops. The price drops are welcome, although it has closed the gap between the 13in MacBook Air models and the entry-level 13in MacBook Pro with Retina display. The extra £150 (or in the case of the mid-range Retina MacBook Pro, the same price) is a reasonable price to pay for a faster machine. Of course the Retina MacBook Pro is heavier: 1.57kg compared to 1.08kg, and the MacBook Air is thinner and has longer battery life. Positive: Good build quality; Retina display; decent performance; good autonomy. Negative: Expensive. Positive: Slim and lightweight; longer battery runtimes than the predecessor. Negative: The same design with the predecessor. Intel Iris Graphics 5100: Integrierte Grafikkarte (GT3), welche in einigen Haswell-ULV-CPUs (28 Watt TDP) verbaut wird. Im Gegensatz zur GT3e/Iris Pro Graphics 5200 fehlt der zusätzliche eDRAM-Cache. Einige nicht anspruchsvolle aktuelle Spiele können mit geringen Details noch flüssig gespielt werden. Für Office und Video natürlich ausreichende Leistungsreserven. » Weitere Informationen gibt es in unserem Notebook-Grafikkartenvergleich und der Benchmarkliste. 4278U: Auf der Haswell-Architektur basierender LV Dual-Core Prozessor mit integrierter Grafikkarte und DDR3-Speicherkontroller.» Weitere Infos gibt es in unserem Prozessorvergleich Vergleich mobiler Prozessoren und der Prozessoren Benchmarkliste . 91.11%: Es gibt nicht sehr viele Modelle, die besser bewertet werden. Die meisten Beurteilungen liegen in Prozentbereichen knapp darunter. Manche Websites verschleudern gute Bewertungen, andere dagegen sind sehr streng. Em ehesten entspricht dieser Bereich einer Verbalwertung "gut".